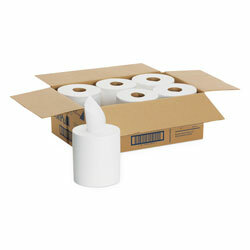 Are you looking for a cost-effective way to stock your high traffic areas with great paper towels? Here at ReStockIt.com, we believe that we have the answer you've been looking for. SofPull® center pull paper towels are a hygienic, budget-friendly alternative to the typical full size paper towel dispenser. What many find notable about center pull towels is that the sheets dispense completely open for quick and easy use. The SofPull® center pull paper towels are comparable to leading paper towels and Scott paper towels in that they are soft and very absorbent. This makes these towels a wonderful choice to have on hand in classrooms, daycare centers, medical offices, laboratories, and anywhere else that you value the availability of paper towels with softness and absorbency. Whether you are looking for Bounty paper towels, Scott paper towels, recycled paper towels, or other great paper towel choices, ReStockIt.com has it all! Soft, strong, absorbent. Towels dispense fully open, dry effectively with less waste. One-at-a-time dispensing; ideal for kitchens and bathrooms. One-ply premium grade. 7 7/8 x 15. 7 4/5" x 15", fits SofPull® Dispenser GEP-58204 (sold separately). Towel/Wipe Type: Center-Pull; Application: Bathrooms; Material(s): Paper; Number of Plies: 1. INNER PACKAGING: 6 Rolls per Case. 320 Sheet. White Centerpull Paper Towels from Sofpull! 5307 In Stock today. I like that I can get this PO in one day. Very low pricing on this item! Easy to load - easy to use! We have this in a dispenser in our breakroom right over the sink. They are always ready to go whenever you need them. High quality product at a very economical price. Works great in our work areas and clients like it as well. The dispensing of the paper towel is great. The paper itself could be thicker. Cleaning and maintaining facilities is simple with the right janitorial supplies including cleaners, scrubbers, gloves, mops, brooms and more. ReStockIt.com has sofpull center pull hand towels 6 per case available at up to 40% discount. Brooms, cleaners and mops are also available. ReStockIt.com is the source for janitorial and cleaning supplies.